During the Q&A after Joyce’s address, you will see in the AAC feed Rachel Abrams’ live drawing of Joyce’s keynote address. You can see more of Rachel’s work from the conference here and learn more about her live scribing here. 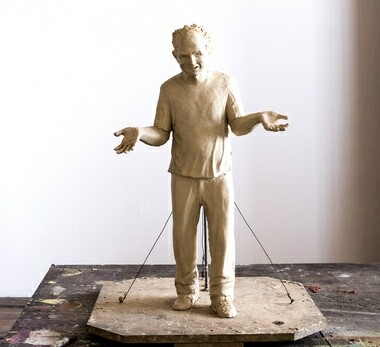 One subject Joyce doesn’t discuss in her talk that I’d like to highlight is the new statue of Harvey Pekar which will be dedicated in Cleveland October 14. You can see Joyce describe the genesis of this statue on her Kickstarter project page, you can learn what Joyce did with her wedding ring as part of the project in this You Tube video, and watch more cool behind-the-scenes stuff about the statue-in-progress in this video. If you’d like to contribute to remaining expenses on this project, to be a part of this historic event, you can learn more directly from Joyce here.